What do Philippine Bank's savings account products all have in common? earns from his savings account deposit is a mere .250% per year. once a year or compounded yearly. subjected to a 20% withholding tax. earned money for safekeeping, What will you look for in a bank? I will look for a bank that offers the following features. 1. Very low initial deposit to open a savings account. 7. Very stable based on length of existence. meets all of the above except perhaps the .250% interest. 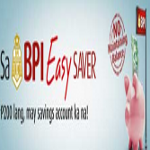 insurance, BPI has proved itself to be a credible and strong bank. pwede po bang mag sent sa easy savers account ung kamag anak na nasa usa? oo pwede, may kilala nga ako na nagwowork sa US, nagpapadala sya from US, wellsfargo yung name ng bank na pinagpapadalhan nya deretso sa bpi account nya pero malaki charge doon at may charge pa dito sa pinas yung recipient, kung 1000 dollars ipinadala doon, di na eksakto 1000 matatanggap dito.